Create an interactive exhibit with tablet stands that hold your tablet securely in place so visitors can use safely. 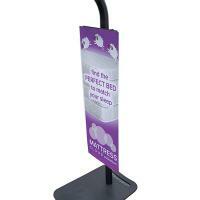 Small foot print and stable base make these display stands versatile and easy to use. These are free standing displays that can be used in many applications including retail display stands, office tablet stands, event display stands, universities, colleges, hospitals and more. We offer competitive pricing on large orders and can help you arrange shipment, please call with questions or a free estimate. Based in Millville, MA outside of Boston, we have been in business for over 30 years in large scale printing and custom displays.